A new user group of mountain bikers and horse riders has been formed to provide feedback on shared recreational trails in the Redlands. Division 6 Councillor Julie Talty said the community representatives would contribute their ideas and experiences towards improving the network of shared, multiuse trails across the Redlands. “Our city has a wealth of natural attractions, including great recreational trails that are popular with horse riders, mountain bikers and bush walkers, and Council is committed to ensuring multiuse trails are suitable for the needs of the entire community,” she said. “Regular visitors to the trails will have noticed Council has been mulching the shoulders of fire trails to provide a softer surface for horses and mountain bikers, which was undertaken following user feedback. 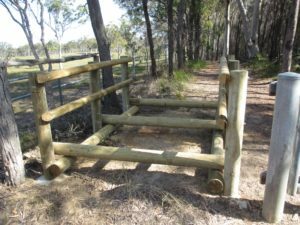 Cr Talty said recent improvements at the Bayview Conservation Park, a 970 hectare public conservation estate at Redland Bay, had created an additional route for horse riders, mountain bikers and bush walkers to explore. “Following feedback from the community, an additional 2.5km of multiuse track linking Kidd Street to Mudlark has recently been completed at Bayview, providing a total of 28km of wide, shared tracks in the park,” she said. “Called ‘Kidds Corner’, the new track is a serene trail with sweeping views across the rolling open plains to the east and provides extra loops for users to explore. This is particularly exciting for the horse riding community. An additional section of multiuse trail at the southern end of the reserve on the ‘Crinklebush trail’ will also be extended, providing an extra 3km of multiuse trails and providing greater connectivity for horses and other users. Visit our website for recreational trail maps in the Redlands. Posted in Community, Feedback, Parks, Tourism and tagged bush walking, horse riding, mountain biking.